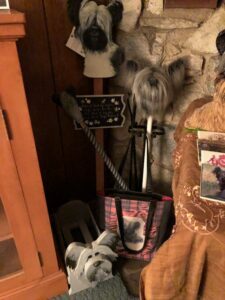 Northridge Estate Sale, Everything Scottish, Skye Terrier Dog collectables, Antiques, furniture and fine Art! 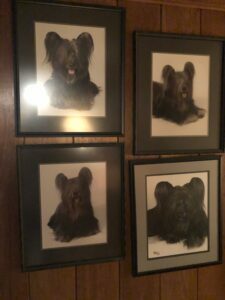 Beverly was a champion dog breeder; she dedicated her life to the preservation of Skye Terriers. 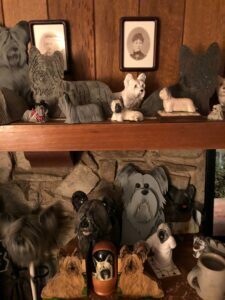 Almost everything in her home had a dog pictured on it and she was very proud of her Scottish heritage. 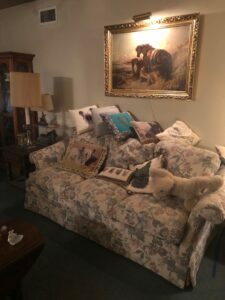 This house has amazing deals on vintage collectables, vintage furnishings, vintage Scottish and dog themed items, Antique art by listed artists, jewelry, clothing, kitchen collectables, bedding, lighting, etc. 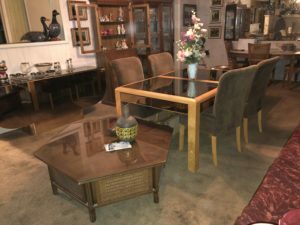 Van Nuys Estate Sale, unusual vintage Retro collectables, furniture, jewelry, a full house. 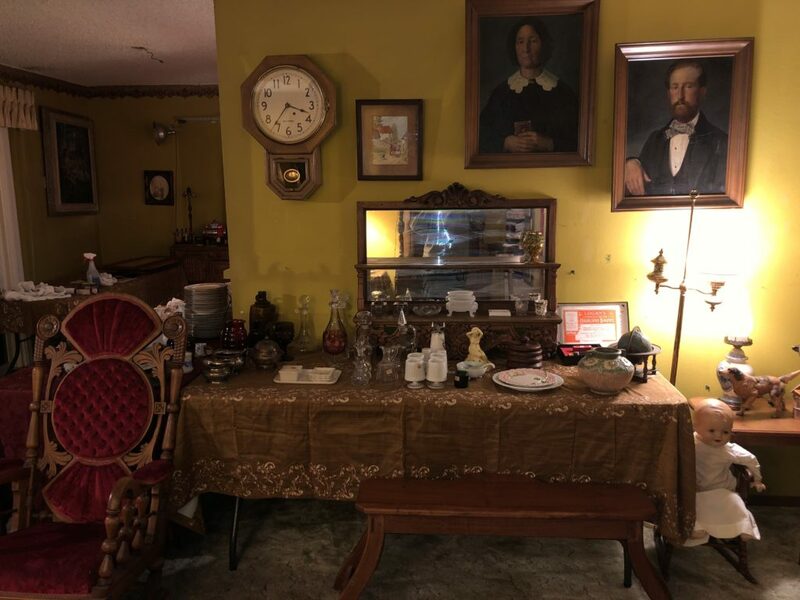 This house has amazing deals on vintage collectables, vintage furnishings, vintage jewelry, sewing items, clothing, kitchen collectables, etc. 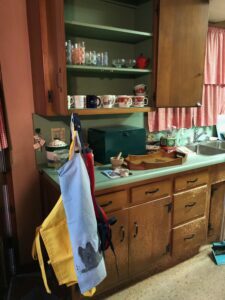 A full house occupied by the same family since 1959. 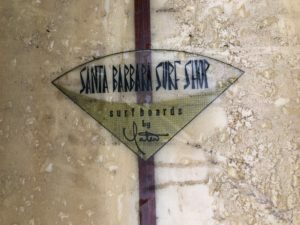 A vintage 1960’s Santa Barbra Surf ShopLong Surf board by Yater, a rare survivor from the golden age of surfing. 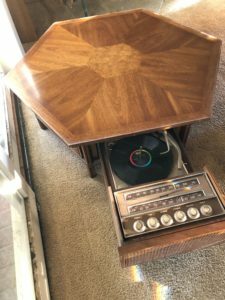 A highly unusual Motorola Stereo Hi-Fi DD11 with amplifier, turner receiver and turntable built into a Drexel Triune Hexagonal Coffee Table from 1959! This is as weird and wonderful as it gets with vintage console stereo units! A HUGE MAXI KING BED, This vintage custom-made bed with a mattress that is larger than the biggest King bed you can ever imagine! 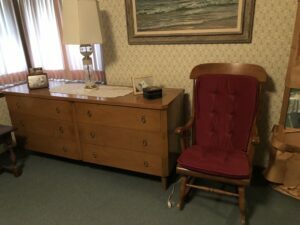 Looks like its two full size beds but its actually one huge mega king bed on a Drexel headboard and frame made around 1960. Its in good condition also, still supportive and clean despite its 58 years. If you want a awesome huge Retro bed, this is as good as it gets. 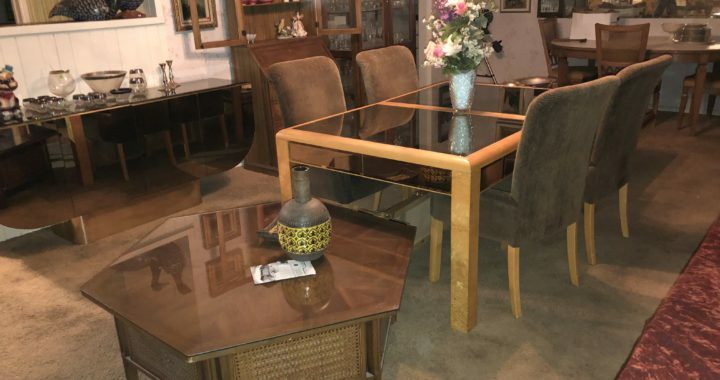 A wonderful Mid Century Modern Burl wood Milo Baughman/Paul Evans Cityscape Styledining room table with 4 chairs and an amazing Mid Century Modern mirrored buffet with matching coffee table. Two traditional vintage Edwardian dressers with matching nightstands, Dinette set, Traditional dining table with 3 chairs, Wonderful Sea Mist Green ultra swade covered fainting couch sofa, Apothecary / Dental style multi drawer dresser, Full size Brass bed, Mirrored Wall Unit Bar Display case, TV stand, and Samsung Hi – Def Smart Flat screen TV, Two Lazy Boy style adjustable Lounge Recliner chair and “Lift” chair that electrically razes to lift you up from your seated position. 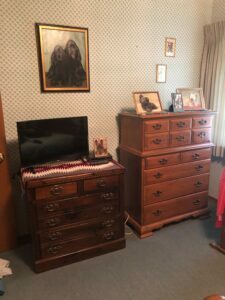 Quarter sawn oak round oak table, vintage Cedar chest, vintage Edwardian desk, vintage metal file cabinets, vintage 1960’s brown refrigerator and vintage 1960’s Marigold Yellow O’keefe and Merritt Electric stove, a newer top load washer and dryer, etc. 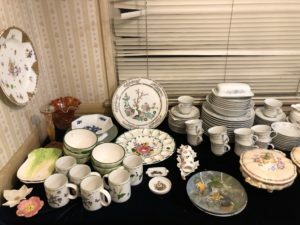 We also have vintage flatware, glasses, dish sets, (Franciscan) whimsical figurines, vintage Hummel’s and Gobels figurines, vintage silver and vintage costume jewelry, vintage 70’s / 90’s ladies clothing and handbags, purses, vintage Pyrex and kitchen collectables, vintage oil paintings, vintage Singer sewing machines, Kenmore Sewing Machine and sewing notions, kitsch artwork, Electric Keyboard, Cd’s, DVDs, vintage books, WW2 Japanese Dress Sabers, vintage fish tanks, vintage Christmas decorations, etc. 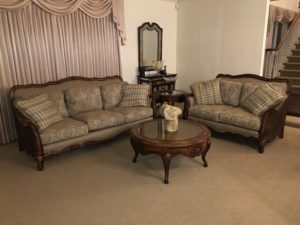 Woodland Hills Estate Sale, Moving Sale, great deals on fine furniture and jewelry. 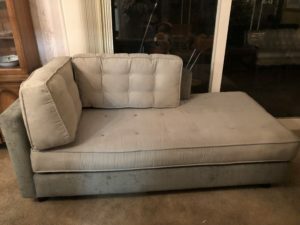 This house has amazing deals on great furnishings, beds, jewelry, etc. A Honda vintage 1971 CB 100 Motorcycle. 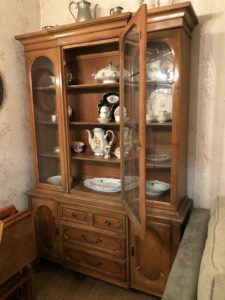 An almost new Thomasville high end dining room table with 8 chairs and amazing china hutch buffet. 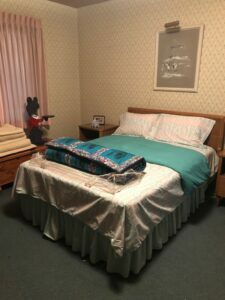 Thomasville Cal King bed (very nice clean newer mattress) with two night stands and dresser set. Wrought iron Dinette set, glass topped table with 4 chairs, Wonderful natural canvas covered Restoration Hardware sofa, rustic end tables, lovely sofa and love seat set, great round coffee table, antique style hand carved sideboard, white wicker dresser with mirror, King sized sleigh bed with mattress and night tables, Apothecary style multi drawer dresser, Childs Crib that is expandable to twin size bed and grow with your child, Cal King bed on Harvard frame, Queen bed, TV stand and Flat screen TVs, French light sconces, fountains, potted plants, nice BBQ and Redwood Patio Furniture. 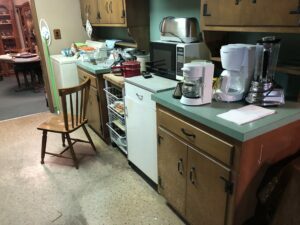 Two refrigerators and a top load washer and dryer. 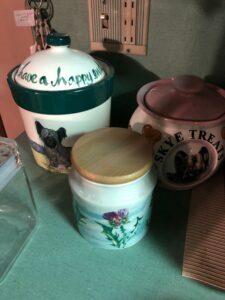 We also have flatware, glasses, dish sets, (Franciscan) whimsical figurines, vintage jewelry and designer shoes and purses. 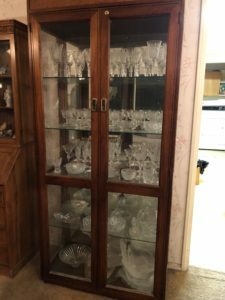 Woodland Hills Estate Sale, Antiques, Victorian treasures and fabulous finds. 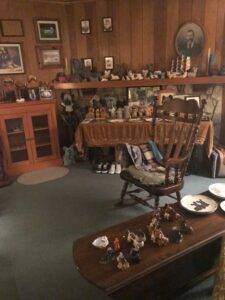 This house is full of Antiques, clothing, collectables and art. If you love antiques and Americana, you will love this place. Furnishings include a twin hospital bed, full size vintage Colonial four post bed, full size Antique Brass bed, matching Victorian night tables, vintage bedroom dressers, Antique pump Organ, dry sink, English Renaissance Revival solid oak buffet and highboy, Victorian mirrors and mirrored shelves, Antique Samplers and embroidered art, antique oil paintings, vintage Lithographs, advertising tins, English Barley Twist drop leaf table, Victorian oak drop front desk, very cool retro 60’s biomorphic orange sofa, 50’s storage unit, marble and oak double sided commode, recliner chair, Victorian rocker and chairs, Victorian Piano stools, oak side tables, ornate original late 19 century Bradly and Hubbard Iron Horse cast iron oil lamp chandeliers and Antique table lamps, vintage Italian Regency alabaster lamps, antique wall clocks, vintage stereo. 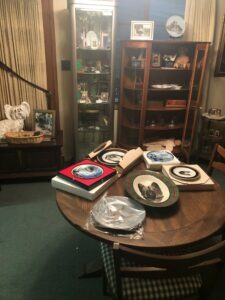 We also have antique flatware, glasses, dish sets, (Franciscan Desert Rose, Wildwood and English Transfer ware), pressed glass and Depression glass, cut crystal, stemware, antique country kitchen items and Graniteware or Tin, Crocks, many antique cups and saucers, crystal vases, collectable cast Iron doorstops and toys, advertising novelty collectables, vintage Jim Beam figural whisky bottles, whimsical figurines, antique doll, vintage cameras, vintage jewelry, bronze and ceramic antique figurines, bird houses, garden statues, vintage patio furniture, etc. We have lots of vintage LP records, many Jazz, blues and lounge music, some 45s, books, CD’s and cassettes. 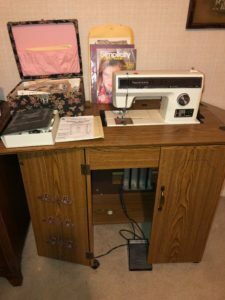 We also have a huge assortment of woman’s and men’s clothing, shoes, bedding and linens, some vintage and some still unused with the tags still on them, Sharp AR-M277 and Sharp AR-200 Copy machines, invalid care items, wheel chair, walker, plants, vacuum cleaner and a full garage. 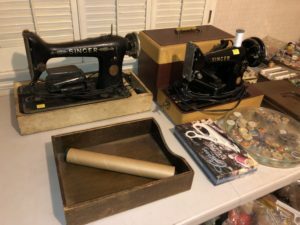 Everything you need to decorate your Victorian parlor or cabin! …and all the footwear is in perfect condition (albeit a little dusty). 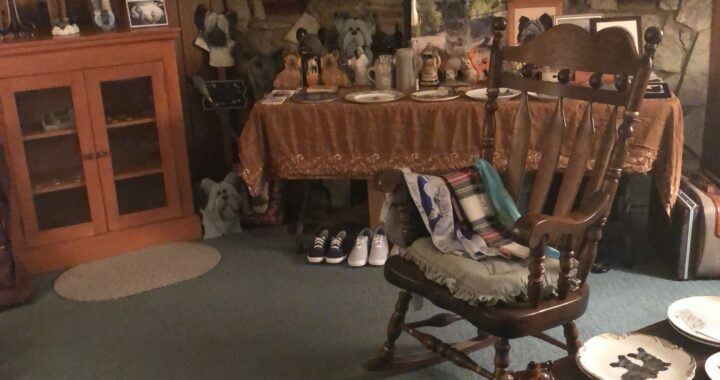 An American family have unearthed an Aladdin’s cave of mint-condition vintage shoes in an old building they inherited from their grandparents. The building operated as a shoe store from the 1940s until the 1960s, but the doors had been locked for decades. Until now. 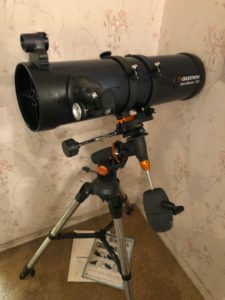 One of the family members posted the rare find to online noticeboard Reddit recently, but stopped short of revealing the location, so as to prevent any break-ins. The historic collection is likely worth a small fortune. 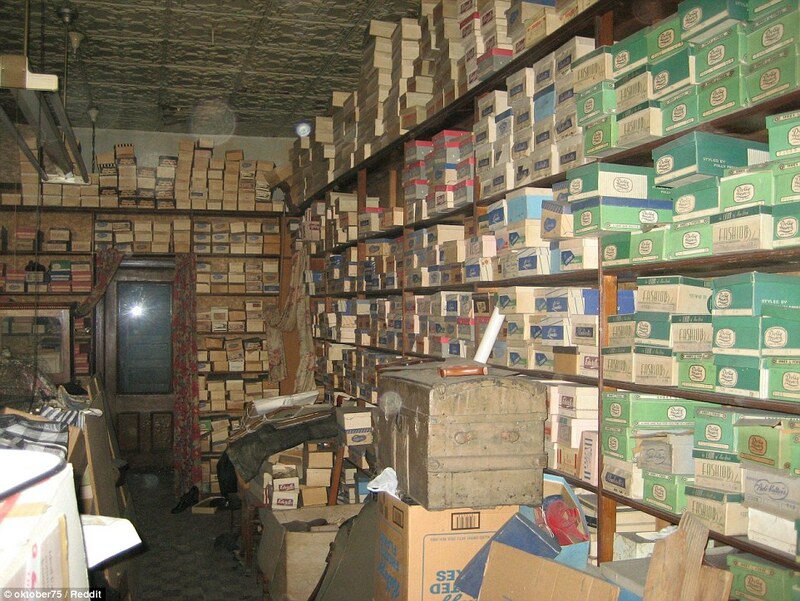 All the shoes appear to be completely untouched and are at least 50 years old. Despite some dust they are practically good as new. The store closed when the grandmother fell ill and the family, too busy to manage it themselves, decided to close it, the blog Messy Nessy Chic reported. ‘I have no idea how profitable (the business) was, perhaps that was a factor (in it closing),’ the user, Oktober75, posted on Reddit. 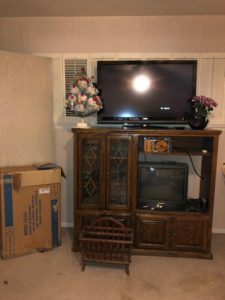 ‘My grandparents were known for hoarding. My guess is they went with the mentality ”it will be worth something some day”. However the user reiterated that the location will remain a secret, for security reasons, until the family is ready. ‘When we’re ready to draw attention, I’d be happy to share more details,’ the user wrote. 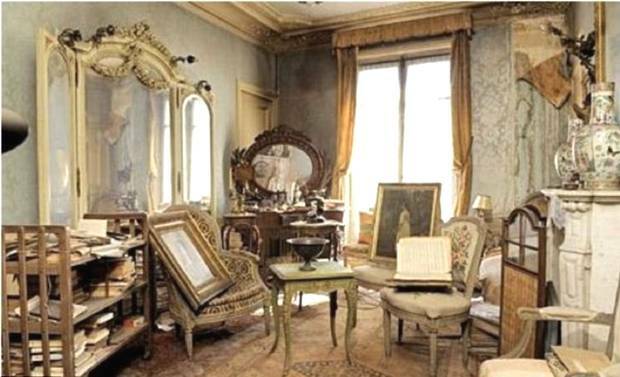 Eerie new images have emerged of a French apartment abandoned at the outbreak of World War II and left untouched in the seven decades since. Other than a thick layer of dust covering the furniture, the room looks exactly as it would have done 70 years ago when its occupants fled Paris for the south of France as the Second World War erupted in Europe. With Germany devising the Fall Gelb – a military sub-campaign later known as the Manstein Plan, with an objective conquering Northern France – the owner of the chic apartment decided that leaving the capital was the only way she could guarantee her safety. UPPERVILLE, Va. — Few people have ever visited Oak Spring Farms, the grand home here of Rachel Lambert Mellon, better known as Bunny. 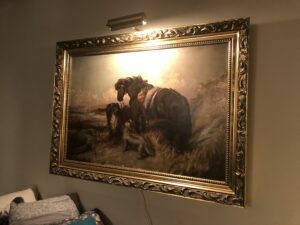 If they had, they would have seen a Pissarro, unframed like a flea market find, above the living room fireplace. Upstairs, a still life by van Gogh hung above her bathtub. Antique porcelains — cabbages, asparagus, artichokes — were artfully arranged on practically every surface. Mrs. Mellon was the matriarch of an American dynasty whose fortune and art holdings rivaled that of the Fricks, Carnegies and Morgans. 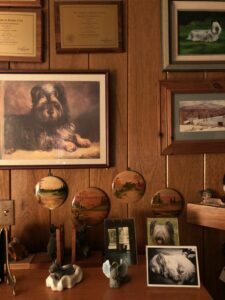 But perhaps most notably, she was a passionate collector of a bygone era. She didn’t pay attention to what was in fashion; she didn’t think about future financial returns. 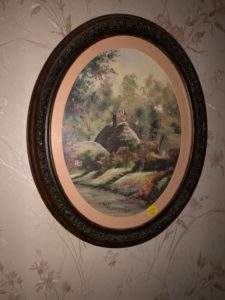 Instead, she had understated and original taste, buying what she loved, free from the dictates of decorators and investment consultants. 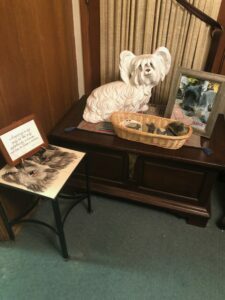 “Bunny was part of a generation that no longer exists today: an amateur collector with a sure eye, great taste and upper-class refinement, who bought across the board, from expensive jewelry and paintings to trinkets,” said John Wilmerding, an American art scholar and trustee of the National Gallery of Art in Washington. She was also fiercely private and rarely opened her home to visitors. 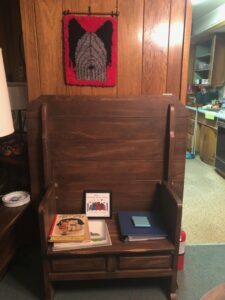 So when Mrs. Mellon died in March at the age of 103, no one knew the full extent of what she left behind. It turns out there are thousands of objects — paintings, drawings, jewelry, handbags, baskets, even a fire truck — most of which will soon be up for auction at Sotheby’s. It estimates her collection could bring in over $100 million. Sotheby’s plans a nine-day extravaganza, starting on Nov. 10, eventually turning over the galleries on all 10 floors of its New York headquarters to display what was on the walls and in the cupboards of the five homes she shared with her second husband, Paul, the son of the financier Andrew W. Mellon. With estimated prices from $200 (a 1940s hooked rug) to $30 million (a painting by Mark Rothko), Sotheby’s hopes to draw not just wealthy buyers but also anyone eager for a small piece of Mrs. Mellon’s legacy. The sale comes at a critical time for Sotheby’s, which has been battered by tepid spring auctions and a board battle. It is surely betting that its estimated prices will be eclipsed by buyers bidding wildly for, say, a cast-metal bunny (estimated price: $1,000 to $1,500). In 1996, when Sotheby’s held a similar sale of Jacqueline Kennedy Onassis’s estate, people waited in line for hours to glimpse John F. Kennedy’s golf clubs and her 40-carat diamond ring from Aristotle Onassis. Those auctions, over four days, raised $34.4 million, more than six times its estimate. 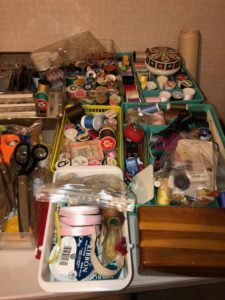 On a visit to the Mellon estate here in July, everything had been assembled, tagged and organized like a perfectly planned military operation. 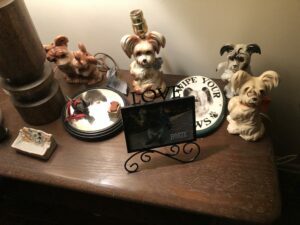 Sotheby’s specialists in areas like English furniture, Chinese porcelains, American paintings and contemporary art had combed through more than 20 buildings on the property and documented every one of some 4,000 objects, tagging every teacup and fork. 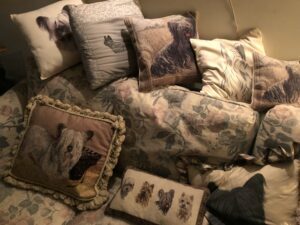 “We felt like interlopers moving into a notoriously private and protected world,” said Elaine Whitmire, a vice chairman at Sotheby’s who oversees major estate sales. So, it seems, does every pair of gardening shears she ever bought. A self-taught horticulturalist, Mrs. Mellon designed the White House Rose Garden and, of course, the gardens surrounding her own houses, too. 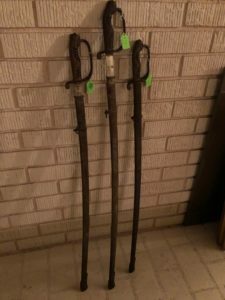 A lot of 27 pieces — two bentwood pitch forks, three watering cans, four pruning shears, a hoe, nine umbrellas, three shovels, three walking sticks, a bamboo walking stick concealing a saw — is estimated to sell for as much as $600. And then there is the art: more than 400 paintings and drawings, including Picassos, Seurats, Hoppers and Homers. Before the auctions, prominent collectors tried to buy the best paintings privately. The estate quietly parted with several canvases including two by Rothko and a Diebenkorn, said Alexander D. Forger, her friend, lawyer and an executor. “It seemed prudent to take advantage of the offer,” he said. “We’ve got estate taxes to pay by December.” He declined to name the buyers or the prices, which dealers said totaled around $300 million. Auction houses also jockeyed for the estate sale. Sotheby’s and Christie’s prepared elaborate presentations with mock catalogs, simulations of the gallery installations and worldwide marketing plans. Mr. Forger had been an executor of Mrs. Mellon’s great confidante, Ms. Onassis, and selected Sotheby’s for that sale. But his choice was not based on familiarity alone. While neither he nor Franck Giraud, the art adviser to Mrs. Mellon, would discuss specifics, both said that she was angry with Christie’s owner, François Pinault. In 2002, she agreed to sell him three Rothko paintings for around $25 million. They had been on loan to the National Gallery since the early 1970s, and Mrs. Mellon parted with them only after Mr. Pinault contractually promised to exhibit them in what was to be his foundation for contemporary art on the Île Seguin, in Paris. But when his plans for the space in Paris fell apart, Mr. Pinault moved the project to the Palazzo Grassi in Venice, where the works were on view only once. Two years ago, he sold one of the paintings, “Untitled (Blue, Green, and Brown),” from 1952, to Steven A. Cohen, the hedge fund billionaire, for more than twice what Mr. Pinault paid for all three paintings, according to dealers familiar with the transaction. 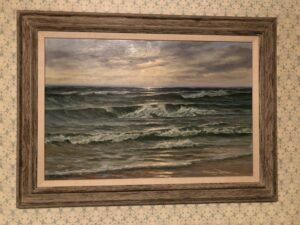 Last year, he sold a second, “Yellow and Blue” from 1954. Nazanine Ravaï, Mr. Pinault’s chief of staff, said that the Rothkos were to be displayed in Paris, but that they did not fit with the programming in Italy, and there was no permanent place to house them. Mr. Pinault, she said, plans to keep the third Rothko. Space was not an issue at Oak Spring, a working dairy farm. There was the stone cottage where the Mellons lived, stables for prizewinning thoroughbreds, a pool house designed by I. M. Pei and the Brick House, a Georgian-style mansion. 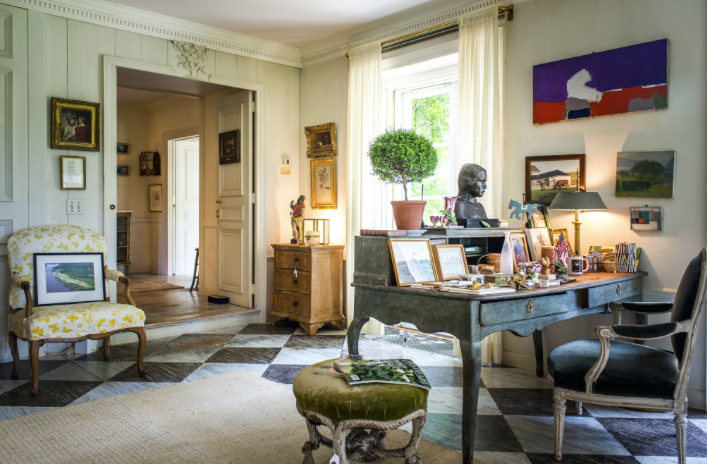 A building was devoted just to Bunny Mellon’s collection of baskets: Shaker, Native American, florist shop generic, and antique discoveries. (The property also includes one of the country’s earliest private airstrips.) Oak Spring itself was put on the market last month for $70 million. “Every book had to be shaken to make sure there wasn’t a drawing or love letter tucked inside,” Ms. Whitmire said. To raise as much money as possible for Mrs. Mellon’s foundation, the executors decided putting her property up for auction would be the best approach. 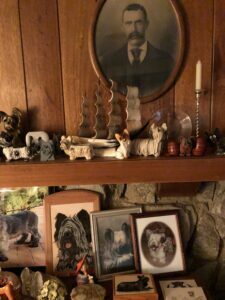 Deciding what to give back to the family — Mrs. Mellon’s son, Stacy B. Lloyd III, and his two children, as well as Mrs. Mellon’s two stepchildren, Catherine Conover and Timothy Mellon — was a delicate balancing act. “Sometimes, things are just too personal,” Ms. Whitmire said. 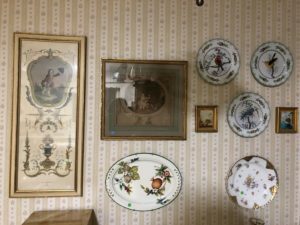 Among other things, family members selected a Pissarro painting from her bedroom, one of Mrs. Mellon’s Givenchy gardening hats, furniture that she designed, and a picture frame by Schlumberger that contained family photos. 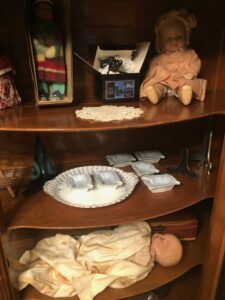 While Ms. Whitmire and others culled through the buildings, a few discoveries were made: One of Joseph Cornell’s famous box assemblages was unearthed in a bathroom cabinet; a Magritte watercolor was found in a rarely used room.